Avoid an Aching Back While Camping This Summer: DMR Clinic Shows You How! Summer is upon us, and so are several months of fishing, camping, and hiking. These are all fun activities that we look forward to, especially in the gorgeous state of Minnesota. But, before you head out for your summer adventures, take a moment to think about what these activities mean for your spinal health. We believe an ounce of prevention goes a long way, so here are some tips to get through the best months of the year with your spine healthy. Go to your local camping store and have them fit you for a backpack. This isn’t the backpack you throw clothes in for a weekend away or to go to school with. This is the type of backpack that has a frame built into it, padded straps, and other support features. It’ll protect your spine from injury and distribute the weight of its contents, protecting you from injury and back strain. While the initial investment could be high, these packs are worth the cost in the long run and will last several years. Now that you have the right pack, resist the temptation to overfill it. Just because it has extra support doesn’t mean it’s going to completely prevent you from injury if you stuff 100 pounds of equipment into it. When you’re carrying gear from the car to your campsite, err on the side of caution and carry small loads, even if it means taking more trips. Use your legs to lift instead of bending over. If you feel pain, stop! In the case that you have overdone it, make an appointment with one of the talented massage therapists in our Woodbury clinic for a soothing therapeutic massage and bodywork. If you already know you have back issues, take an air mattress with you. These can be inflated using the adapter in your car and can make the difference between a fun camping trip and a miserable one. Pack your usual pillow, and you’ll have the support you need to get a comfortable night’s rest. Take the time to find just the right shoes for camping and hiking. Your regular tennis shoes aren’t cut out for strenuous hikes, especially if you’re going up steep inclines and over rocky terrain. Get a pair of hiking boots with ankle and arch support, and ask for help from the staff at the shoe store to ensure you select the right pair for you. Be sure you break the shoes in before you leave so you’re not dealing with blisters during your trip! 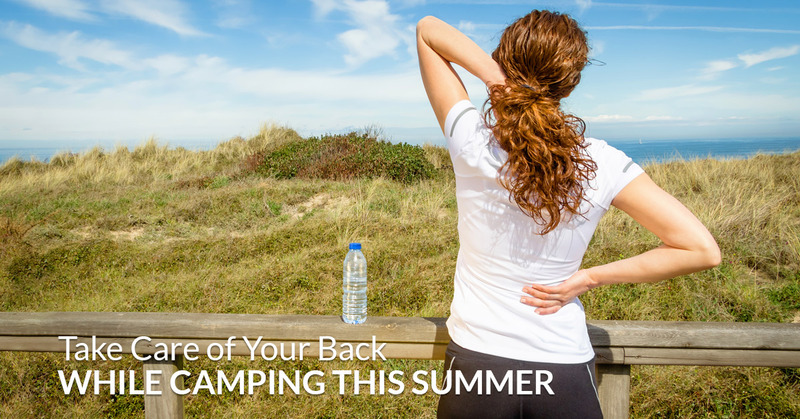 Camping and hiking are fun summer activities, but they can take a toll on your back and the muscles all over your body. DMR Clinics’ Woodbury clinic offers several types of therapeutic massage techniques, including Swedish massage, deep tissue massage, sports massage, and trigger point massage to soothe what ails you. Make an appointment today!